In 1969, when the home of Berkshire Freemasonry moved from its previous home in Reading ('Old Greyfriars', now a Sainsbury's on the corner of Friar St/Greyfriars Rd), Sindlesham Lodge No.8293 was the very first lodge to be consecrated at the newly acquired Berkshire Masonic Centre in Mole Road, Sindlesham. Sindlesham Lodge is twinned with Beaver Lodge, No. 885, in the constituency of the United Grand Lodge of Germany. Beaver Lodge meets in Soest. 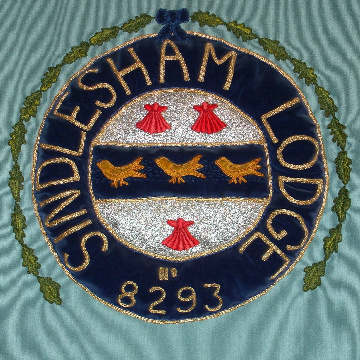 Sindlesham Lodge is a small friendly and inclusive Lodge, which meets at Sindlesham Court, on the Third Friday in April (Installation), May, June, September and October.